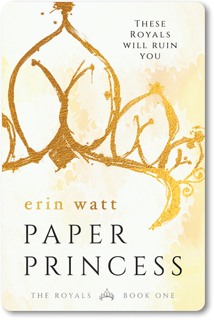 The Paper Princess is a book that no words can describe, written by Erin Watt, a brain child of the two accomplished authors Jen Fredrick and Elle Kennedy . With the roller coaster of emotions in store, be prepared to be ruined by the Royals. Ella Harper is the definition of a survivor. Losing her mom at age fifteen to cancer and not having her father in the picture is tough and she and her mother are not exactly rich either. In order to pay for her mother’s treatment bills and support herself after her mother dies, she works three jobs, including her mom’s old job…stripping! Introducing Callum Royal, a business man for whom being called rich would be an understatement. He can buy the state of North Carolina, not to mention he is good-looking for an old guy. After taking Ella back to his mansion, he introduces his five -yep, five- sons who all have the looks of a supermodel. They are: Gideon who is a freshman in college and a swimmer, Reed who plays football for his high school, Easton who is a junior in high school and plays football with Reed, and finally the twins, Sebastian and Sawyer, who play lacrosse and are sophomores in high school. Oh, and Ella? A junior in high school and currently moving in with her five new, very attractive, brothers. Erin Watt grasps you in with the very first page through her vibrant and lively writing and leaves you with a cliff hanger at every twist and turn possible. Involving the reader’s emotions, she leaves nothing to the imagination and makes you feel as involved in the story as the main characters. Although Watt’s story line is unpredictable, it is a good unpredictable, keeping the reader on their toes the entire time, never knowing what is coming out of the left field next. It is one of my favorite books of all time, and I would recommend it to high school girls ages 13 and up because there is definitely some mature content. Be sure to check out the rest of the Royals series if you want more. Erin Watt grasps you in with the very first page through her vibrant and lively writing and leaves you with a cliff hanger at every twist and turn possible.